Proving yet again that CDB’s sales team remains an unparalleled force in sales leadership, Citizens Development Business Finance PLC (CDB) once more gained three prestigious awards at the annual NASCO Awards held at BMICH recently. A Gold award and two Silver awards were presented to CDB at the gala ceremony which annually recognises and rewards sales leadership, distinguishing those who pave pathways with commitment, dedication and a constant need to set higher targets. From CDB’s proven sales leadership team, Kandana Branch Manager Isuru Fernando was presented with the prestigious Gold as Sales Supervisor/Executive in the Financial Service Provider Category, while Branch Manager Dehiwala Malith Fernando won the Silver. 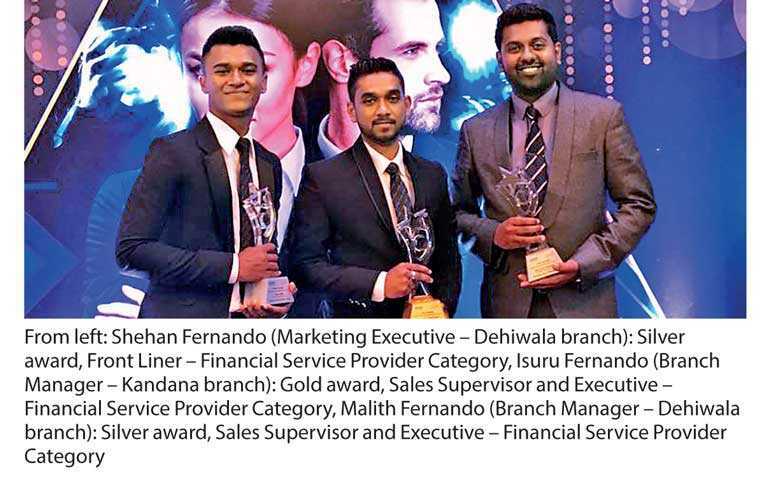 Marketing Executive Dehiwala branch, Shehan Fernando won the Frontliner award also in this category, making him the youngest Sri Lankan to win a NASCO Award. Organised by the apex national marketing body in the country, the Sri Lanka Institute of Marketing (SLIM) this year recorded the highest ever participation in the history of the awards. “What make our wins most admirable is that as many as 700 entries were vetted by the eminent panel of judges,” said CDB MD/CEO Mahesh Nanayakkara. The CDB Sales Team has continually won accolades at the NASCO Awards, with three such laurels also being bestowed on its team members last year as well. The awards recognise the immense contribution made by sales personnel who drive corporate success, a feature that Nanayakkara explains further in detail. With its commitment to build and develop a world-class sales force that thrives on challenges, exploits opportunities, thinks beyond the norm and has excellence as its foundation, CDB’s wins at the NASCO Awards are now spurring the team to venture towards even newer heights. Building on its pioneering spirit and entrepreneurial mindset, CDB trains and develops its team to map its own journey, taking ownership for its efforts and rewarding both individuals and teams for continually pushing boundaries.